The key to finding happiness at work may not have anything to do with you at all. It was a bitter northern Colorado winter day last December. The kind of day when college students hopefully wait for the magical e-mail letting them know class is cancelled. It never came on this day. The campus was a barren bright white desert as windswept snow swirled across an almost-empty parking lot. I was on campus early for a meeting and as I was walking on an uncleared sidewalk, I saw one of the campus facilities workers on the opposite sidewalk get off his adapted backhoe and start manually and meticulously clearing a portion of the concrete. He was diligently making sure that from edge-to-edge, the sidewalk was completely clear. As we made eye contact, he stopped what he was doing and silently trudged over to a piece of sidewalk about 10 feet in front of me, and upon noticing me, vigorously restarted his tried method of clearing the sidewalk. “As long as I can keep these sidewalks clear for the students, I am a happy man!” he said, laughing hard to himself. There was no supervisor there to motivate him. There was no one even there (except me) to see and reward him for a job well done. Pay and benefits in that type of job aren’t the greatest. The task itself wasn’t especially designed to be motivating. So, then, what was motivating him? Maybe a better question is: What was pulling him through the apparent drudgery of the work in the unforgiving weather? The object of his behavior was not himself, not his paycheck, not some reward or recognition. It seemed to be something more. His behaviors and attitudes seemed oriented toward something more powerful than the usual motivation suspects. The purpose of a university, the students – as he said himself – was the object inspiring his exceptional work. He was working to deliver the higher organizational purpose and not for himself. It is this space between, the invisible leader, between him and the purpose that modern organizations and their leaders need to be especially concerned with. This space, this energy, is characterized in the psychological literature as self-transcendence. If you are in your office right now, chances are that that at least one of the people in the offices on either side of you dislikes their job. With 70 percent of Americans disengaged in their work and managers and leaders theorizing how to motivate a purpose-oriented millennial workforce, commitment and motivation bestsellers are in vogue. The problem is that most of these books focus on things we can “do” to push employees and not the things we believe in that pull employees toward something greater that themselves. We try to keep employees happy, not recognizing that happiness and well-being themselves are not sustainable objects of behavior, rather, as Maslow and Frankl hypothesized, these are the side-effects of pursuing a meaning or calling greater than oneself. Studies back this up. Psychologists have found that when over 435 college students were surveyed, 68% of them indicated that a spiritual calling and sense of higher purpose at work was important to them. When over 370 employees were surveyed, 62% percent of them indicated that a connection to a higher purpose was a critical aspect of their work. This is precisely why focusing on the psychological and spiritual notion of self-transcendence to a higher organizational purpose is critical in the modern workplace. This physics lesson provides an example of why most motivation tactics in our organizations ultimately fail or are short-lived. We are trying to push people by offering rewards, big salaries, and flashy perks. This is hard and expensive pushing! And, it almost always is short-lived. Self-transcendence can best and most simply be defined as the phenomenon that occurs when one’s behaviors are oriented toward an object outside of oneself. In the workplace, studies have shown that one of the most powerful objects of this behavior is a higher organizational purpose that serves society and others beyond the bounds of the organization. By creating and fostering organizational cultures that are oriented toward a compelling global purpose, thereby inspiring a self-transcendence to this purpose, we can pull employees toward a inspiring higher organizational purpose. Because a higher organizational purpose and meaning is never able to be completely satisfied because of its global nature, the pull will always be there. 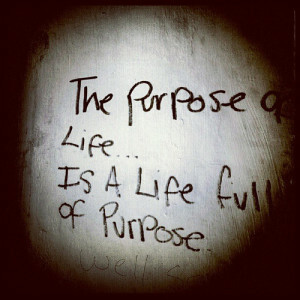 That is why in organizations with a deeply held and compelling higher organizational purpose, there is a constant striving to deliver the purpose. That is why, I believe, in the bitter cold, that worker was meticulously clearing the sidewalk. In this striving to deliver a purpose, happiness and satisfaction are then allowed to ensue – attitudes the American workforce could surely use right now.